The Bicycle Coalition of Greater Philadelphia, AARP-PA, AAA, and the rest of the Philadelphia Vision Zero Alliance, worked over several years to get Senate Bill 172 – which legalized speed cameras along Roosevelt Boulevard in North and Northeast Philadelphia – passed. And today, the Vision Zero Alliance celebrated long-fought victory for traffic safety in Philadelphia at a Mayoral press conference about the first year of Vision Zero. The victory was a large group effort, supported by State Rep. John Taylor (R-Philadelphia), and was made possible through the fierce advocacy of Northeast Philadelphia resident Latanya Byrd. 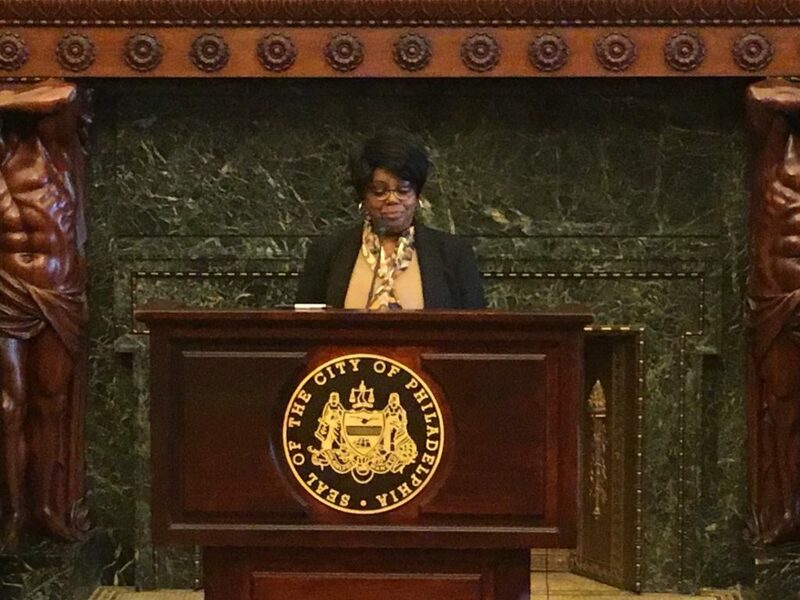 In 2013, Byrd lost her niece, and three of her niece’s children, to speeding drivers on Roosevelt Boulevard. She has worked with the Bicycle Coalition and Vision Zero Alliance over the last two years to legalize speed cameras and make Philadelphia safer. AAA-Mid Atlantic, an organization that worked alongside AARP-PA and Bicycle Coalition of Greater Philadelphia, were at Friday’s event, as well, and noted their satisfaction in seeing this process come to a close. Sarah Clark Stuart, executive director of the Bicycle Coalition of Greater Philadelphia, noted this is an important delivery for the City of Philadelphia to reach zero traffic deaths by 2030. The city also introduced their neighborhood slow zone program, as well as reduced neighborhood speed limits. Philadelphia is now able to take advantage of existing technology that will, along with other traffic calming measures, like protected bike lanes and neighborhood slow zones, help make travel throughout the city safer. Thank you to all who worked to bring this about. Especially Latanya Byrd,who after a heartbreaking loss, became a spokeperson for speed cameras…and all others who worked to bring this about. Of course Roosevelt Avenue could be made safer with some simple engineering changes and correct signage. That was NOT what the PPA and PennDOT wanted – they want the revenue from leaving the roadway less safe and adding for-profit speed cameras. The same goal is true for the red light cameras which have caused more crashes at camera intersections from the very beginning of the for-profit program. But PPA and PennDOT are happy to cause more crashes with the cameras because so much revenue is collected. No one should tolerate these cynical for-profit programs about revenue, not safety. Mr. James, you are completely wrong, speed camera’s in NY have made the streets safer and the revenue simply covers the cost of the camera program, in addition, the revenue goes down as people realize that the cameras are there and slow down. The only people who don’t want camera are speeders. Thank you so much, Latanya Byrd, for advocating for this life-saving technology. The last reporting I saw on NYC cameras included something like $50 to $60 million in annual profits. Roosevelt Avenue is more dangerous than most collectors and arterials due to its design. There are many things Philly could do with engineering to reduce the dangers, but they would be cost items in the budget. The cameras will be a profit center which is the goal. There are many things Philly could do to reduce dangers at red light camera intersections and stop causing more crashes with the cameras at those intersections. Those actions have never been taken, and probably never will be, the profits are too high to want to reduce or stop. BOTH speed and red light cameras could be used to target only dangerous drivers, the ones that deserve the tickets. But then the cameras would be serious cost items in city budgets and virtually no cities will use the cameras if they lose serious money vs. their high costs.